Whether you say phyllo, fillo or filo, it all roughly translates to "leaf" and is the thin sheets of dough that are the basis of baklava, a sweet pastry traditionally filled with chopped walnuts and soaked in sugar syrup or honey. The Greeks and the Turks claim this dessert as their own invention, but you also will find it in the Balkans, Middle East and North Africa. If you're ambitious, try a homemade phyllo and baklava recipe. For fun, make these untraditional but delicious versions - chocolate and bacon. Yes, bacon! Semisweet chocolate chips, pecans, cinnamon, and an orange sugar syrup put a new spin on an old favorite. Have a half-sheet pan (measuring 13x18 inches or another pan with dimensions close to those) at the ready. In a medium bowl, combine pecans, cinnamon, 1/4 cup sugar, and melted chocolate chips and mix well. Set aside. Dampen two lint-free kitchen towels. Open the package of phyllo and unroll the entire stack on one of the dampened towels. Immediately cover with the second dampened towel so the pastry doesn't dry out. Brush the sheet pan with clarified butter. Layer half of the phyllo dough one sheet at a time, brushing each individually with butter, in the pan. Evenly spread half of the filling mixture on top of the phyllo. Top with a sheet of dough that has been buttered on both sides. Layer on 6 more phyllo sheets that have been buttered on both sides. Top with remaining filling mixture followed by 1 sheet of phyllo that has been buttered on both sides. Layer on the remaining phyllo dough one sheet at a time, brushing each individually with butter. Using a sharp knife and a sawing motion, cut the baklava into 40 to 50 diamond-shaped pieces. Brush the baklava with the remaining clarified butter. Bake 40 to 50 minutes or until golden. Carefully lift a piece to make sure the bottom is brown but not burned. Twenty minutes before the baking time is up, make the syrup by mixing 1/2 cup sugar and orange juice in a small saucepan. Bring to a boil over medium heat, stirring often. Reduce heat to medium-low and simmer 10 minutes. Stir in vanilla. Immediately after removing the baklava from the oven, pour the hot syrup evenly over the pastry. Let cool on a wire rack. In a small heatproof bowl or measuring cup, combine 2 ounces chocolate chips, 1 tablespoon butter (not clarified) and water. Microwave in short bursts, stirring often, until melted and smooth. 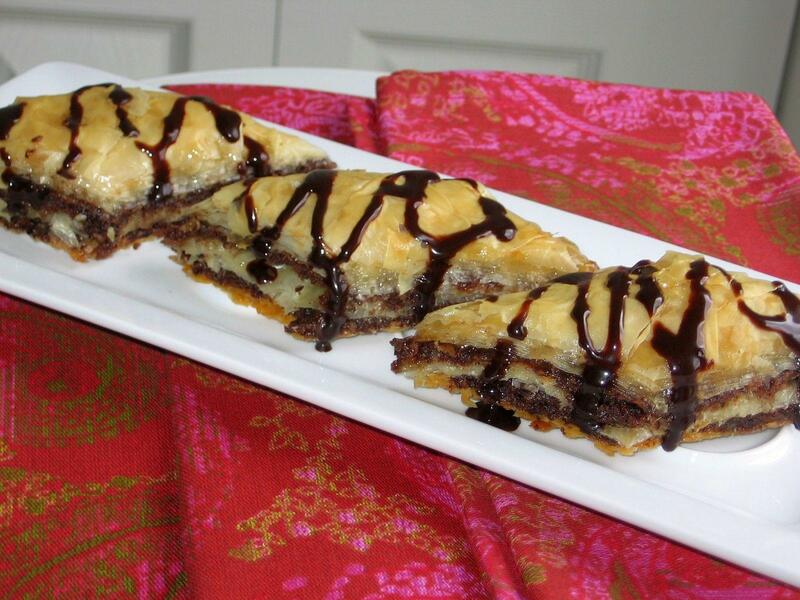 Using a fork, drizzle glaze over the cooled baklava. When glaze has set, serve at room temperature or store, refrigerated and covered. This dessert will keep for at least a week if not longer. Desserts featuring bacon have been trendy for some years now. This recipe features bacon, walnuts, and maple syrup. Who doesn't love bacon? This version can be made in a 13x9-inch pan by scrunching up the thin phyllo and patting it down before coating with the clarified butter. Have a 13x9-inch sheet pan at the ready. In a medium bowl, combine walnuts, bacon and brown sugar and set aside. Get two lint-free kitchen towels damp. Open the package of phyllo and unroll the entire stack on one of the dampened towels. Cover the stack immediately with the second dampened towel so the pastry stays moist. Brush the baking pan with clarified butter. Place 1 sheet of phyllo dough in the pan, scrunching to fit. Brush with about 1 tablespoon butter. Layer on 2 more sheets, one sheet at a time, scrunching in the pan to fit and brushing with butter. Evenly sprinkle 2/3 cup of filling mixture on top of the phyllo. Repeat with 3 layers of buttered phyllo followed by 2/3 cup filling until ingredients are used up. Brush with all remaining butter. Using a sharp knife and a sawing motion, cut the baklava into 40 (2-inch) diamonds or 80 (1-inch) diamonds. Bake about 45 minutes or until golden brown and flaky. If you use a glass pan, you will be able to check if the bottom is brown but not burned. About 10 minutes before the baking time is up, in a small saucepan, combine maple syrup and water. Bring to a boil over medium-high heat. Reduce to medium-low and simmer 5 minutes. Stir in bourbon. Immediately after removing the baklava from the oven, pour the hot syrup evenly over the pastry. 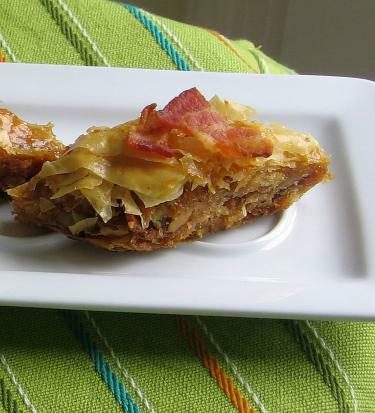 Place a few pieces of chopped cooked and drained bacon on each piece of diamond-shaped baklava. Let cool on a wire rack. Serve at room temperature. Cover and refrigerate any leftovers. This dessert will keep for at least a week if not longer. Phyllo dough is the perfect vehicle for many sweet and savory foods, including tarts, turnovers, and strudels. If baklava is on your radar, try experimenting with different nuts like hazelnuts, macadamias, pistachios, and almonds. A really neat way to put a new spin on this dish is by varying the sugar syrup by adding or substituting ingredients like rose water or cardamom or lime juice, for instance. Let your creativity be your guide, you're driving!